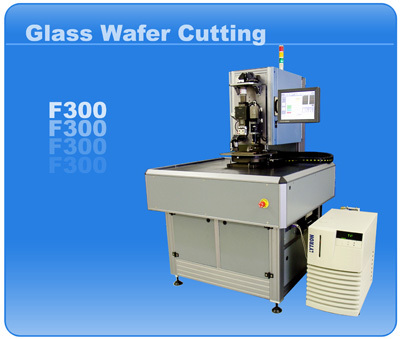 The F300 Glass Disk Cutting Machine combines stationary laser and dual optical systems with a single rotation and glass holding system. This allows for highly accurate cutting with nearly perfect concentricity. This machine can be configured to cut many different materials: glass, Crystalline Quartz, Sapphire, Silicon, Silicon on glass, Lithium Niobate, Lithium Tantilate, or many others. Pricing has been broken down into components to allow users to customize machine capabilities for their specific needs without incurring unnecessary costs. Requirements beyond those listed below can be quoted on an as needed basis. Call our office if you need any assistance determining which capabilities best suit you needs. F300 Machine and Facility Specifications. 3 x 110/380 V. 50 -60 Hz, 8 kVA.